Roger Paul presenting a training on Wabanaki language and history to a room of Portland teachers at Portland's Lincoln Middle School. Nearly two decades ago, Maine passed a law requiring that Native American history and culture be taught in the hundreds of elementary and high schools across the state. Today many schools are still a long way from fulfilling that goal, but a new initiative in Maine's largest city could help restore an educational focus on Wabanaki Studies. Bridgid Neptune remembers a moment from her high school English class in the early 2000s. The school was in a town neighboring the Passamaquoddy reservation where she lived. Neptune says she recalls hearing rude comments from classmates. And her teacher, she says, would not allow the Passamaquoddy language to be spoken in class. "And oftentimes, there were a lot of racist remarks to be made," Neptune says. "I didn't recognize it as racist then, but certainly as I've matured, and had other experiences to reflect on, it was a lot of racist remarks." Even today, Neptune still sees evidence that Indigenous cultures can often be invisible to many. While she volunteered at schools in southern Maine, Neptune says that some students were surprised to learn that Native American people still existed in the state. "They just really were completely shocked when they learned that I was Passamaquoddy," she says. "And that I had a cell phone, and that I did not live in a Tipi. So it showed there really needed to be a systemic change in education." So when Neptune heard that Portland, where her two kids attend school, was planning to create a Wabanaki Studies curriculum to develop resources and train teachers across the district, she supported it. After about a year of behinds-the-scene work, the district decided last year to use federal funds to create a new position focused on promoting equity within the district's classrooms, with a particular aim on crafting a Wabanaki Studies curriculum districtwide. Fiona Hopper, who is leading the district's work, says that some Portland teachers have already created extensive materials around Wabananki history. But Hopper says that isn't true for every teacher, leaving gaps throughout schools to address. "We weren't, as a district, going to be able to do real, meaningful equity work if we weren't addressing the racism of our state and the racism of our curriculum, and the sort of entrenched invisibility of Native people in our curriculum and in our schools," Hopper says. Since the beginning of the year, Hopper and other staff have been meeting with tribal leaders to create the basic outline of a curriculum. That has involved finding new resources and adapting existing ones that tribes have already created. Much of the work has been in conjunction with tribal historians, including Donald Soctomah, the director of the Passamaquoddy Tribal Historic Preservation office. "If I had kids in Portland, I'd want them to know the true story of Maine, before it was a state, up until the last ice age," he says. "How people survived off this land. Instead of, well, the history started when the ships came. That’s pretty much what a lot of schools are doing. And it sort of marginalizes Native American history." The other big effort is helping teachers learn that history. "Most teachers want to do it," Hopper says. "But they don't know anything about Wabanaki history in Maine. They don't know where to look for resources, and they're nervous about doing it wrong. Or even if they're not nervous, don't even know where to begin." Some of this work begins with Roger Paul. 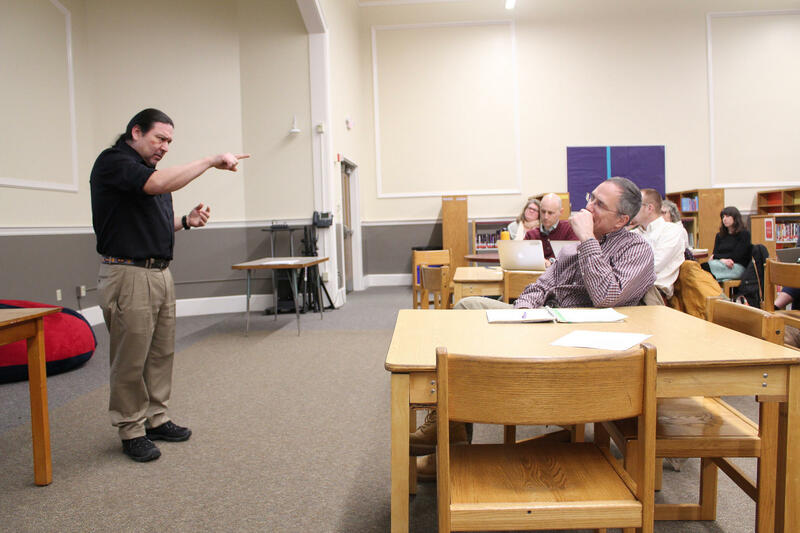 At the front of the library inside Portland's Lincoln Middle School, Paul, a Wabanaki language teacher, is leading a training for dozens of Portland teachers. Paul teaches them some words and leads them through a short Wabanaki history lesson. His goal, he tells them, is to correct the persistent myths about Native Americans created by dominant culture — like that Native Americans no longer exist. "So I'm here, hopefully, to fill those gaps," he says. The district is leading several other trainings for teachers this year, but their work isn't new. In fact, similar efforts began nearly 20 years ago, when Donna Loring, a state representative to the legislature from the Penobscot Nation, sponsored a bill requiring Native American history and culture to be taught in all Maine elementary and secondary schools. “I just saw a need that people needed to know we were here and needed to know about our history," Loring says. "And that we were human, too, just like everybody else." Loring, who is now a senior advisor to Gov. Janet Mills, says the law had an impact initially. Several organizations trained teachers statewide. A commission was formed, and substantial resources and curriculum were created and shared. But like many educational initiatives, funding was limited, and the commission eventually dissolved. "It stopped the progress. It stopped it from moving as quickly as it could have gone. And as well as it could have gone," Loring says. "It had these really knowledgeable people at the core." Portland officials acknowledge that much of their work is still in the early stage, and work is expected to take years to reach the hundreds of educators across the district. But Donald Soctomah, with the Passamaquoddy Tribal Historic Preservation Office, hopes that by leading this push in Maine's largest city, it could help revive some of the state's decades-old efforts. "And they're laying the groundwork for a wider view of a look at the whole population of the state," he says. "Not excluding Native Americans." Soctomah says Portland isn't alone. He says other districts, including some in Washington County, have developed their own curriculum in recent years. He hopes that if districts work together and spread their work, they might eventually help meet the goals of the law that was passed nearly 20 years ago. Originally published Feb. 7, 2019 at 5:26 p.m. ET.